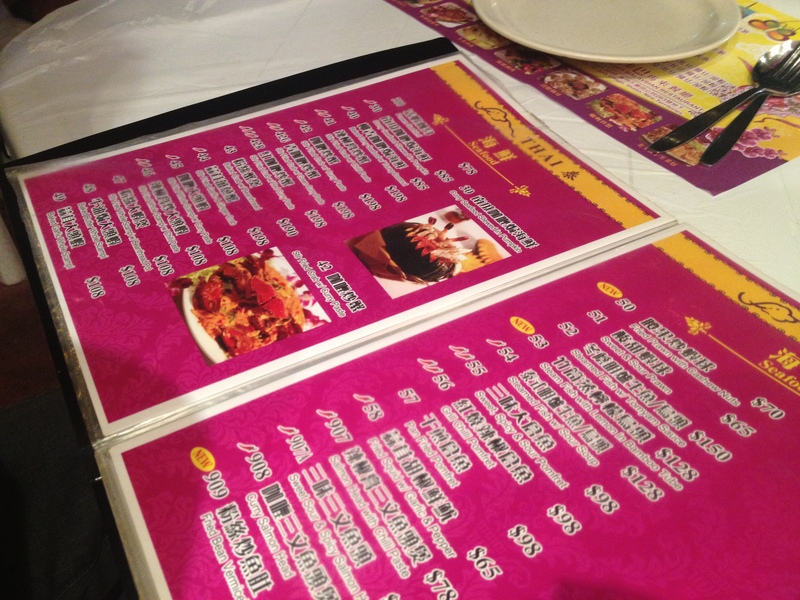 However, it has the most comprehensive Thai and Malaysian menu I’ve ever seen. You could get full just reading this – it’s practically an index of South East Asian culinary history. Obviously, we were pretty clueless after reading through this merciless manual of munch – and additional 60 options on your paper placemats. So I did my fair share of oogly googling at other tables’ dishes instead, and a lot of picture-pointing with the occasional ‘ooh’. 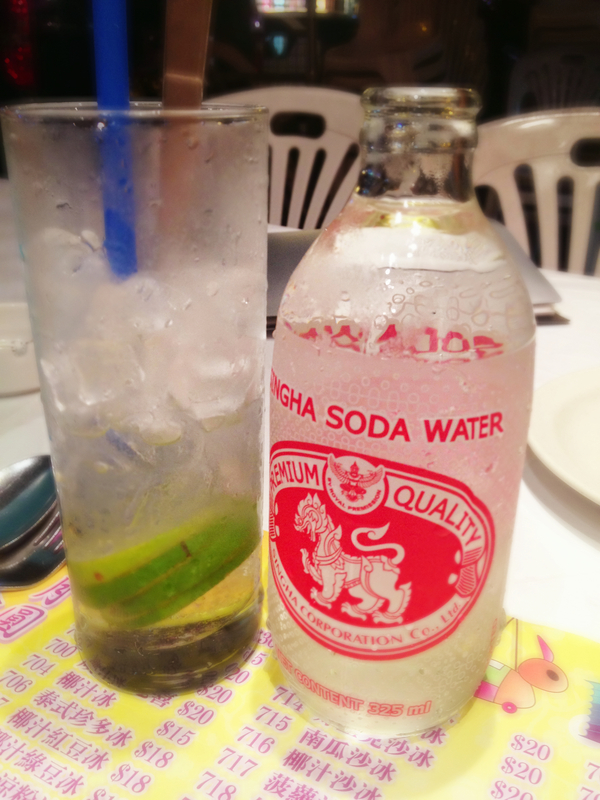 We were taken aback by the ‘Singha Soda Water’ so I felt it necessary to take a picture. This bottle of soda water is apparently produced and exported from Thailand. Snaps for authenticity. The Lime Soda turned out surprisingly tasty too, and refreshing as always. 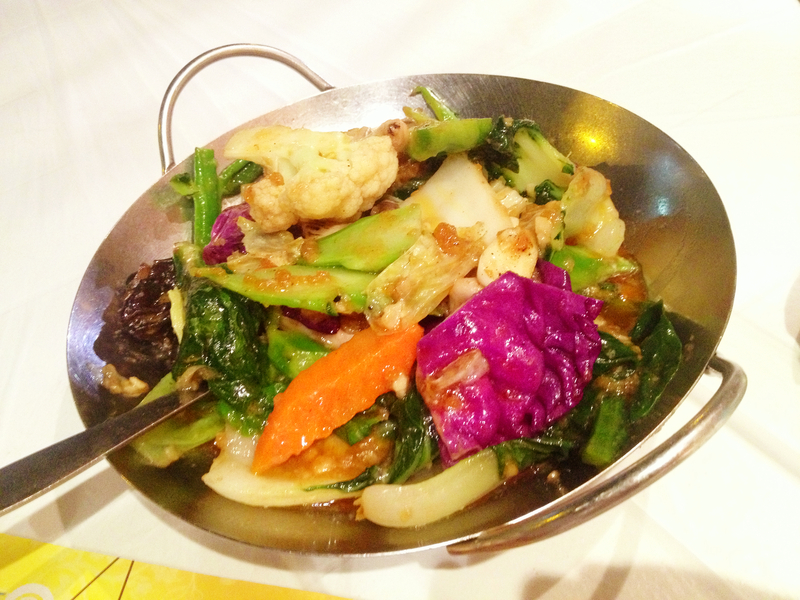 We ordered the Fried Mix Vegetables with Shrimp Paste ($58) on the Thai menu, and were really happy with this. The shrimp paste flavour was not overbearing – more like a sambal with garlic and chili infused with the shrimp extract. You can order all these vegetables you see here separately – purple cabbage, mushrooms, kai laan etc., with salted fish, ‘Thai style’, or with shrimp paste as you see here. I must take this moment to say how much I love the Hong Kong way of ordering food and drink. We are the fussiest diners ever – with less sugar or more sugar in our lemon teas, more or less milk in our milk teas, this vegetable instead of that vegetable, adding a bit of this to that dish and so on and so forth… I’m sure you can see that this restaurant caters to this mentality of manipulating-the-menu-till-the-menu-is-made-redundant very well. Service was lightning fast too. 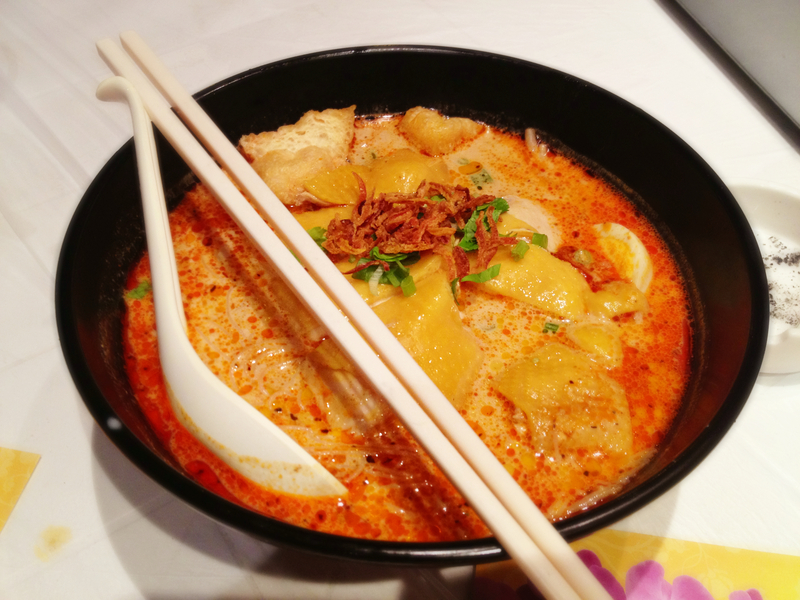 On the Malay menu, we ordered Hainan Laksa ($50). 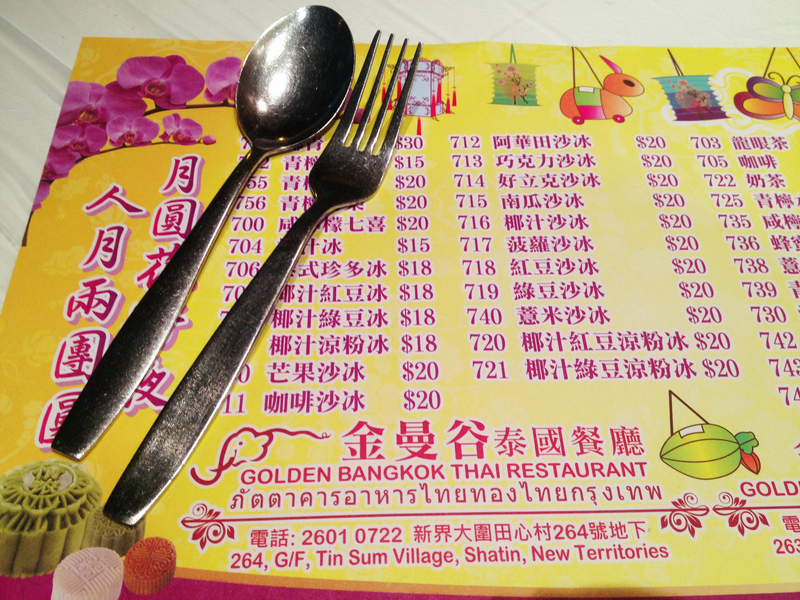 The laksa itself was not as rich as I was expecting, as it was somewhat diluted by the coconut milk. However, I liked the fact that you could choose what kind of noodle you wanted (we went for mai fun, 米粉 – vermicelli) and what topping – Hainan chicken, Thai sausage, etc. The Hainan chicken was also very tender, with nice springy, smooth skin. 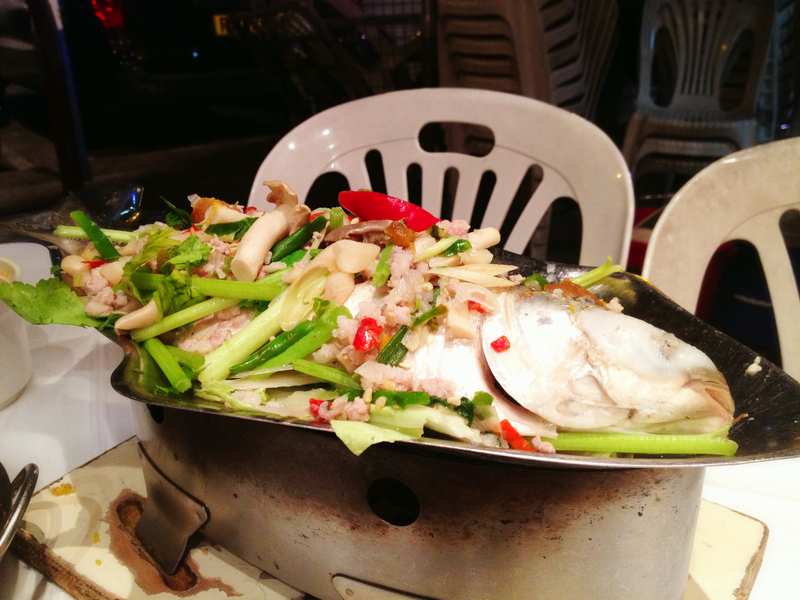 Everyone around us had ordered the Steamed Fish with Sour Soup ($128) so we did too to see what all the fuss was about. We broke the fish up into smaller chunks to soak up the incredibly sour soup, like the mushrooms were doing all on their own. The result was fish soup heaven. The soft, silky flesh lapped up the sour broth which gave a nice kick of lemongrass and chili in its wake. Definitely recommended. 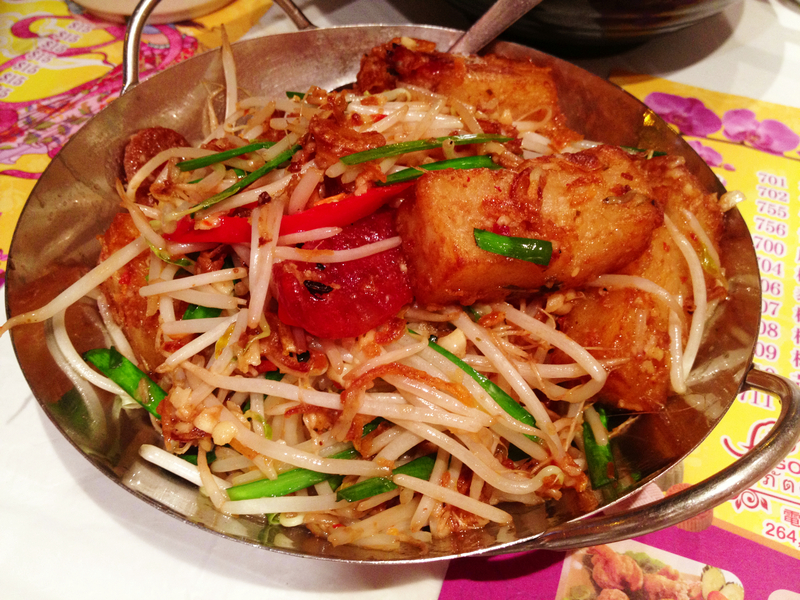 We ordered the Fried Turnip Cake Penang Style ($55) from the Malay menu because I absolutely love turnip cakes!! They weren’t as crunchy on the outside as I was hoping for, but to me – they were still pretty damn yummy. I could eat turnip cakes all day every day so I don’t think I can criticize this dish sensibly enough for you. However, the beansprouts and spring onions did lack seasoning and didn’t quite have the same harmony of spices that the Thai menu had offered us with their dishes. The dish was also altogether quite greasy. This maybe a miss for those who aren’t die-hard turnip-cake aficionados like myself. What a weird thing to be, I know. I’d recommend a lunch or dinner here if you’re around the neighborhood. If you’re hiking around one of the many country parks Tai Wai has to offer, sampling roast baby pigeons, checking out the Heritage Museum or just getting your annual check-up at Union Hospital (I sound like a tour guide…) – whatever the reason – it might be worth stopping by for some Thai. Lord knows you probably ain’t gonna get anything as good when you cross that tunnel again..